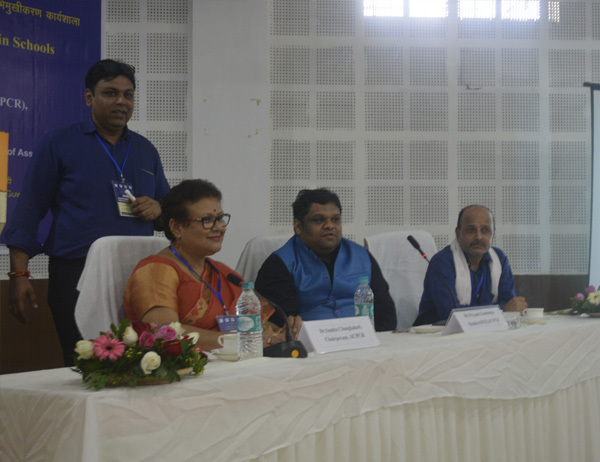 An ‘One day Orientation Workshop on Guidelines for Eliminating Corporal Punishment in Schools' was organized in Guwahati by the NCPCR in collaboration with ASCPCR, on August 19th 2017, at the Axom Sarba Siksha Abhijan Mission Auditorium. The basic motive of the workshop was to inform and refresh with the teachers, the guidelines for corporal punishment and also have an interactive session with teachers on the issue, to come out with better solutions to discipline and teach students without ever using corporal punishment. The workshop was attended by Shri Priyank Kanoongoo, member NCPCR, the Chairperson ASCPCR, Arun Rajoria, Mission Director SSA, members ASCPCR, Secretary ASCPCR, Mr.Paresh Shah, education division NCPCR, and teachers from different government schools of the district apart from officials of the department of Education. The Chairperson, Dr.Sunita Changkakati, while addressing the gathering said how treatment of children in school moulds their psychology. The technical session, conducted by Mr. Shah dealt with the Guidelines for eliminating of Corporal punishment in schools and an interactive session with the teachers present who shared their concerns on the issue. Mr.Kanoongo, speaking on the occasion said that the workshop is just a platform to share some information on Corporal punishment that the National Commission has, and also to learn about the opinions and concerns on the issue, of the teachers who have gathered here. The event saw many teachers freely participating in the interactive session and expressing their concern on how to bring a very in disciplined child to obey and develop well. Incidents in favour and against use of Corporal punishment were also shared.